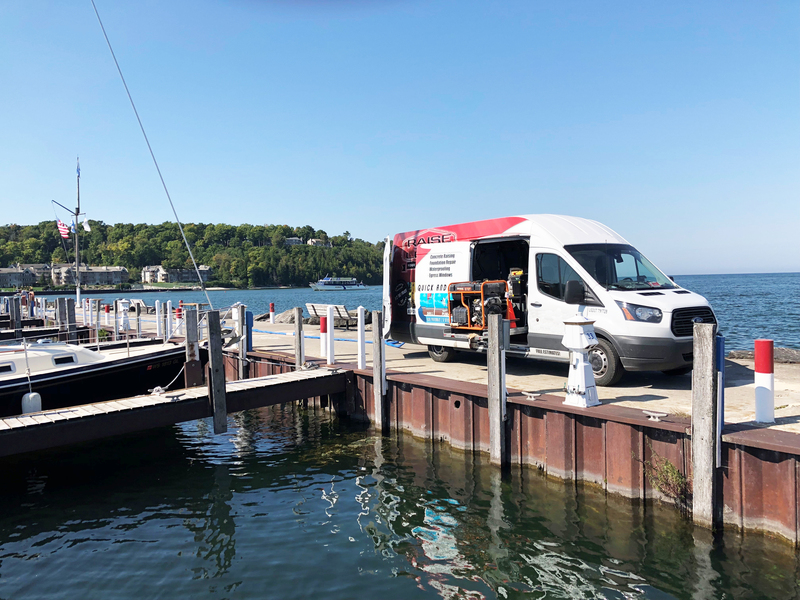 On October 21, 2018 over 30 HMI contractor customers “trekked back home” to HMI’ headquarters in Manitowoc, WI. for the first Special Deep Foamjection Training program. 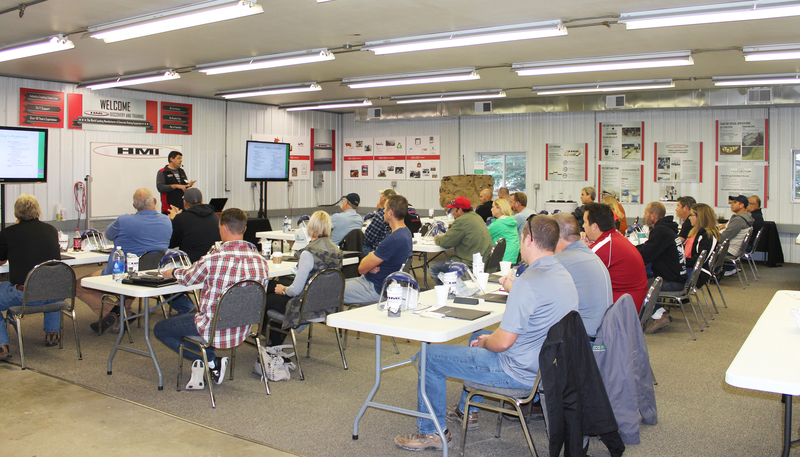 Injecting polyurethane foam, at various depths, in areas where soil problems exist is not new. The process has been deployed for decades but protected by patents which limited the number of contractors providing the service. HMI has been preparing for years to develop the IDEAL system for its customers. Now with patents expired HMI polyurethane concrete lifting customer can offer services equivalent to piering and compaction grouting to: governmental, commercial and even residential markets. Like all HMI processes it is: fast, permanent, non-obtrusive and HIGHLY PROFITABLE. Over a decade ago HMI began offering polyurethane concrete lifting systems to the market. The keys were/are the patented HMI Elite 1 Gun and their own internally formulated foams specifically designed for the unique demands of concrete repair. Since that time polyurethane concrete lifting has exploded. That is; injecting mixed 2 part polyurethane foam liquid components under a slab of concrete allowing the expansion effect of the chemical reaction to lift the slab. Technology developments with foam formulas now have many alternatives in the market to address the control/speed and strength issues the naysayers initially presented as reasons why this would not be profitable or popular. DEEP FOAMJECTION uses the same basic process and equipment. Instead of injecting the liquid Part A & Part B mix just under a slab you are injecting like or comparable mixed liquid foam components at nearly any depth thru especially designed pipe systems which you drive to various depths depending on need. Simply stated it stabilizes and strengthens the environment mitigating the root causes of; structure, road, concrete pad settling. 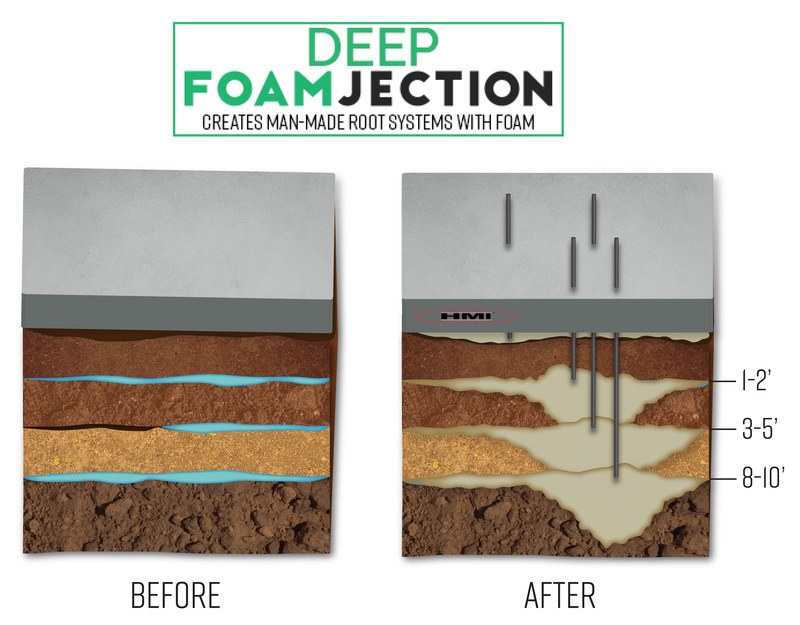 With Deep Foamjection you are addressing the root cause of the problem at various depths. THE FOAM – There are countless foam types, formulas, manufacturers and distributors ready to supply you. However – with Deep Foamjection special care must be taken to pick a partner/supplier that offers a truly hydrophobic foam. Here is where HMI excels. Water is a primary cause of many of the problems. HMI offers truly hydrophobic foams that: set up in water, displace water when setting up, and will not lose strength/density when injected into a wet/moist environments. Highway and Bridge Environments can be stabilized, leveled and reinforced. Equipment pads can be stabilized, lifted and leveled. Retaining Walls can be reinforced. 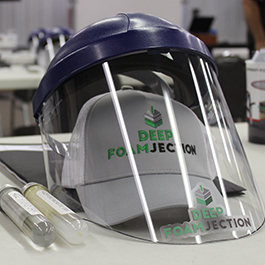 Watch for the next offering of HMI Deep Foamjection training. Add multiple new dimensions and PROFIT MAKING CAPABILITY to your HMI polyurethane concrete lifting equipment.